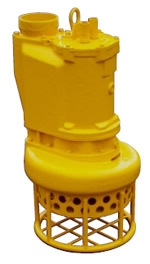 The S6CSL – 6″ Hydraulic Submersible Sand/Slurry Pump with Agitator is designed to use in applications requiring settled solids to be put into suspension and pumped with the discharge water. Primary applications include de-silting waterways. Other jobs may include filling sand bags to prevent beach erosion, tank and digester cleaning or pumping sediment from caissons. Hydraulic Input: 28 GPM (106 LPM) Max. Hydraulic Pressure: 2800 PSI (190 Bar) Max.